Each of the named endowments at Southern Arkansas University represents a treasured relationship – with a friend, teacher, mentor, family member. The endowments and the relationships they commemorate become a permanent part of the memory and the history of SAU. Three recent endowments exemplify the kinds of relationships that endowments celebrate. At Homecoming 2010, members of Phi Lambda Chi gathered to remember their brother Trey Von Sutton with an endowed scholarship in his name. Sutton inspired his brothers and many others on campus as he courageously fought cancer while attending classes. Sutton’s family were special guests for the occasion. Mr. and Mrs. Cameron Dodson were first introduced to young SAU student Corbet Lamkin by Orval Childs, head of the Agri Department. 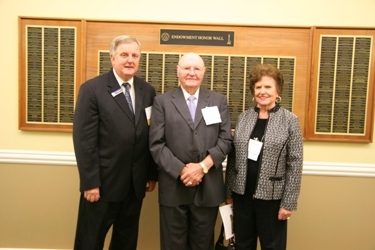 Later the Dodsons initiated an endowment to benefit the Business Agri Department in honor of Dr. Lamkin. At the recent Honors Society Dinner, the three gathered to celebrate the completion of the endowment. Class of 1948 Scholarship Endowment initiated by Mr. Ken Crain and funded by him and his classmates of 1948. Dr. Corbet Lamkin endowment to benefit the Business Agri Department initiated by Mr. and Mrs. Cameron Dodson and funded by Dr. and Mrs. Lamkin and their friends. 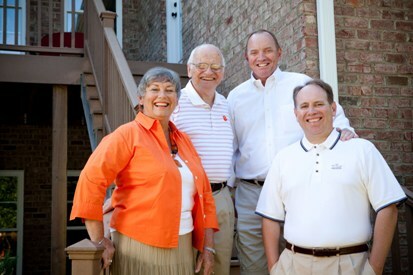 Earl Miller endowment to benefit the Athletic Department was initiated by Jay Adcox and Dr. Jack Harrington and funded by the friends of Earl Miller. Patty Newton Hague (Hague) Miller endowment to benefit Magale Library was initiated and funded by Dr. and Mrs. Rudy Eichenberger in memory of Mrs. Eichenberger’s paternal grandmother. Coach Rip Powell endowment to benefit the intercollegiate football program at SAU was initiated by Mr. Homer Stout and was funded by many of Coach Powell’s friends and former players. Diana N. Pyle endowment to benefit the Special Education Department in the College of Education was initiated by Dr. Robert Terry and Dr. Diana Pyle and was funded by Drs. Jerry and Diana Pyle and their friends and family. Ted G. and Maxine Harmon Ward scholarship endowment was initiated and funded by Ted G. and Maxine Harmon Ward. For a listing of all endowments, please visit the SAU Foundation website at www.saufoundation.org/giving. State appropriations now provide less than forty percent of the University’s budget, making endowments critical for the pursuit of excellence. We ask you to consider beginning your endowment today.